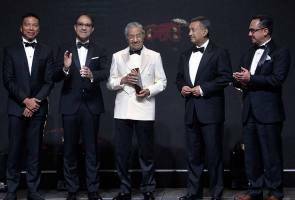 KUALA LUMPUR: Prime Minister Tun Dr Mahathir Mohamad was conferred a Lifetime Achievement Award for his significant contributions and undying support towards national motorsports industry at the Petronas Sepang International Circuit Sdn Bhd (SIC)-Motorsports Association of Malaysia (MAM) Awards 2018 tonight. SIC Chief Executive Officer (CEO) Datuk Razlan Razali said it was a great privilege to honour Dr Mahathir at Malaysia's premier motorsports awards. "Tun Dr Mahathir is by and large the person responsible for the spark that started the evolution of modern day motorsports in Malaysia. Ever since the creation of the SIC in 1999 and introduction of Formula One in Malaysia, Malaysia's motorsport talents have achieved tremendous success locally and abroad. "Within less than 20 years we have young Malaysians racing at the highest level in world motor racing such as Alex Yoong in Formula one, Hafizh Syahrin in MotoGP and our first Malaysian team of Jazeman Jaafar, Nabil Jefri and Weiron Tan in the prestigious 24 Hours of Le Mans," he said when met at the ceremony here, tonight. "On behalf of Petronas, we would like to congratulate Tun Dr Mahathir Mohamad on the conferment of the Lifetime Achievement Award for his continuous support and contribution towards the development of the Malaysian motorsports industry," he said. The Selangor-born rider who brought pride and joy as the first Malaysian in the premier class MotoGP World Championship last season with Monster Yamaha Tech 3 also took home the Malaysia Motorsports People's Choice Award. Malaysia's professional racing driver, Mark Darwin emerged as the SIC National Driver of the Year while 2017 Malaysian Superbike Championship (MBSK) Open 250 Cup winner, Mohd Aiman Tahiruddin won the National Rider of the Year award.